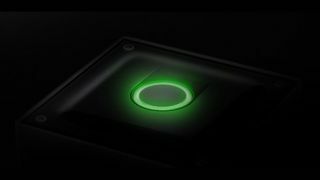 Razer has confirmed that it has acquired Ouya's library and online distribution platform, and will transition them to its "more advanced" Forge TV micro-console. Okay. This is not, strictly speaking, a PC gaming story, but Razer is primarily a PC company, and the Ouya's failure and subsequent absorption—the acquisition actually took place on June 12—will have a direct impact on Forge TV, Razer's streaming box that we previewed in January. "The entire point of the device is streaming from a more powerful PC," we said at the time. But the Ouya move suggests that Razer has bigger plans for couch-based gaming. "Ouya's work with game developers, both triple A and indies, went a long way in bringing Android games to the living room and Razer intends to further that work," Razer CEO Min-Liang Tan said in a statement. "This acquisition is envisaged to usher more developers and content to the Android TV platform." Ouya's technical and developer relations teams have joined Razer, and the Ouya name will be maintained as a separate publishing arm for Android TV and Android-based console games. But it did not acquire the rights to the actual hardware, which will now presumably be left to wither and die, and eventually become a niche collector's item. Ouya founder and CEO Julie Uhrman, who Kickstarted the console in 2012, is also out. "Can't wait to see what you do," she tweeted at Razer earlier today. "Take care of my incredible team and community...I know you will." Razer will re-launch the Ouya store as Cortex for Android TV. Existing Ouya owners will be provided a "clear path of migration" to Forge TV, which will include transferring their Ouya accounts and games to the re-branded platform and "deep discounts" on purchases of Razer hardware.